CALL ME BY YOUR NAME, the new film by Luca Guadagnino, is a sensual and transcendent tale of first love, based on the acclaimed novel by André Aciman. It's the summer of 1983 in the north of Italy, and Elio Perlman (Timothée Chalamet), a precocious 17- year-old American-Italian boy, spends his days in his family's 17th century villa transcribing and playing classical music, reading, and flirting with his friend Marzia (Esther Garrel). Elio enjoys a close relationship with his father (Michael Stuhlbarg), an eminent professor specializing in Greco-Roman culture, and his mother Annella (Amira Casar), a translator, who favor him with the fruits of high culture in a setting that overflows wit h natural delights. While Elio's sophistication and intellectual gifts suggest he is already a fully-fledged adult, there is much that yet remains innocent and unformed about him, particularly about matters of the heart. 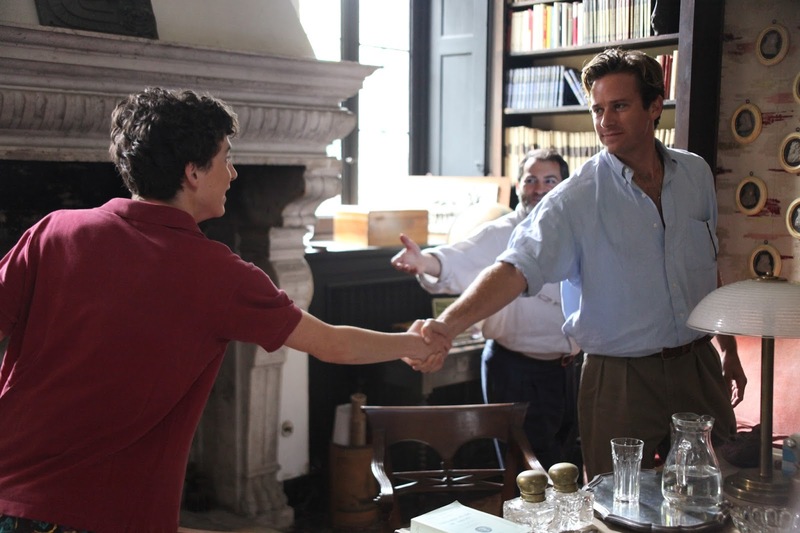 One day, Oliver (Armie Hammer), a charming American scholar working on his doctorate, arrives as the annual summer intern tasked with helping Elio's father. Amid the sun-drenched splendor of the setting, Elio and Oliver discover the heady beauty of awakening desire over the course of a summer that will alter their lives forever. Goodness knows Armie Hammer needs a real hit (while I love Nocturnal Animals, that so isn't his movie). I'm very intrigued to see what he brings to his role as he tends to let his roles be more interesting than his performances. The film itself looks like something I've already seen...a few times. I'll reserve judgment on this one until I watch it. CALL ME BY YOUR NAME is in Select Theaters November 24. I fee like such a hypocrite because when I saw Nocturnal Animals I was like "No way Armie Hammer passes for a dude in his 40's." Then I saw this, and read the character in the book is 24 and was like "No way Armie Hammer passes for a 24 year old."